These quick healthy fish cakes are really easy to make and delicious too. 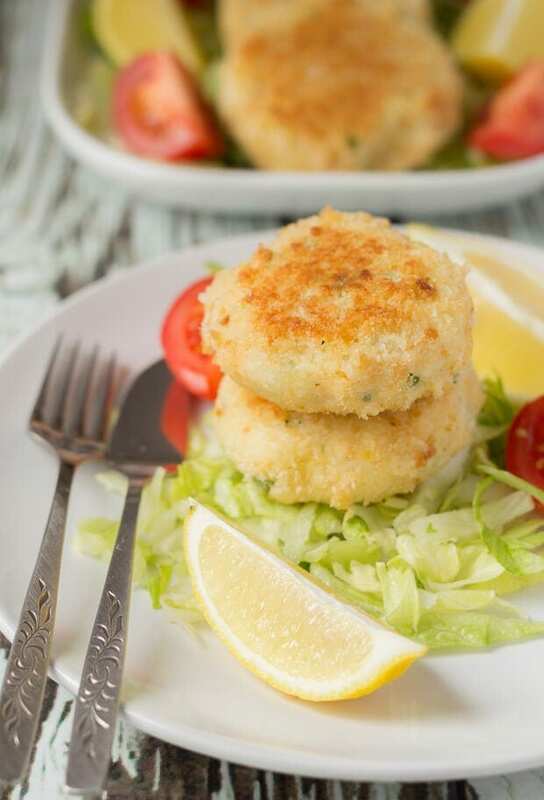 At only 128 calories each, this healthy fish cakes recipe makes 8 fishcakes packed full of flavour. 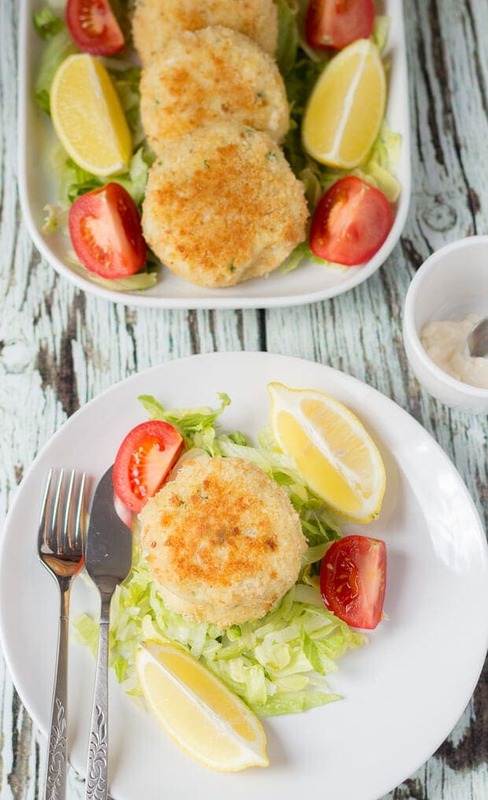 These quick healthy fish cakes are not only healthy but easy on your cash too! 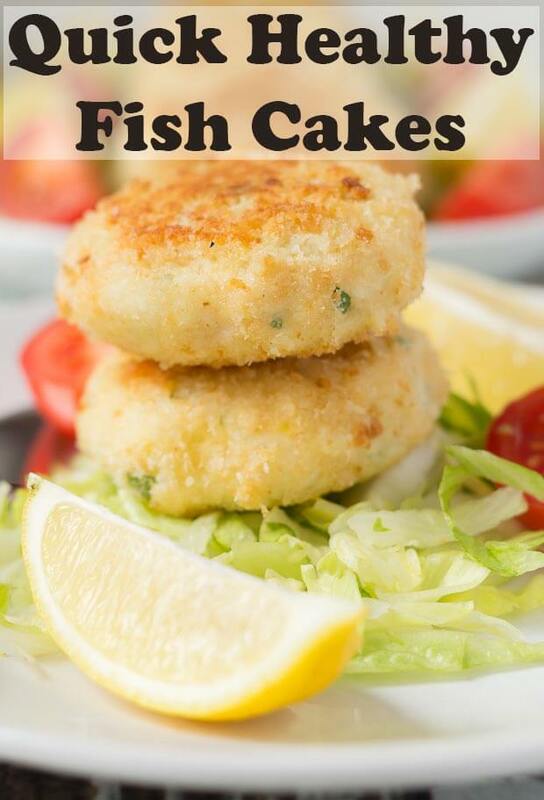 Just like my oven baked fish puffs recipe these fish cakes prove that you can make delicious fish based meals without the need to spend loads of money on the most expensive and popular fish like haddock or cod. Go for the less expensive lesser known white fish like River Cobbler or Coley. I promise you that you won’t notice any difference in taste and these kinds of fish are likely to be more sustainable too, so you’ll be doing the environment a favour as well! 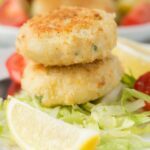 Fish cakes are a great way of making a little fish go a long way and also encouraging children to eat fish when they may not be keen. Plus, by making your own, you know exactly what goes into them, unlike those shop bought processed ones! I’ve told you the story before in the baked cod with caper mash recipe about the fish van coming to my gran’s every Friday and her purchasing fish for our Saturday lunch when we visited. It wasn’t until later in life that I realised they were fish cakes and I tried some shop bought ones. I could only taste potato and couldn’t find or taste any fish. Fast-forward I then got this recipe and I made my own healthy fish cakes – what a revelation. How simple, how delicious and how very cost effective too! Perfect for a thrifty Scottish lad like myself! You only need to shallow fry these beauties in the smallest amount of vegetable oil. This helps to keep the fat content to a very minimum and means you’re actually tasting the fish cakes themselves and not the oil. Only use a couple of teaspoons of oil in a non-stick frying pan over a very low heat to gently cook the first batch of 4 fish cakes. Then change the oil and use the other 2 teaspoons for the final 4 fishcakes which means the oil is fresh for each batch helping to give the breadcrumbs their fantastic golden colour. To re-cook from frozen they only need 12 – 15 minutes in an oven at 180C. The following links and any links in the recipe card below are affiliate links – which means that if you click on it and then purchase that product I’ll get a small commission (at no extra cost to you of course). If you do click through then thanks for being a part of Neil’s Healthy Meals! I use my Jamie Oliver Small Platter White dish here in this recipe for serving and in many of my other recipes too. If you love these healthy fish cakes then I just know you’ll love my smoked haddock fishcakes with poached egg and mustard sauce recipe. They make for a fantastic tasty weekend supper! Right, I’m off to Oktoberfest 2017 this weekend with my old school pals from Dundee. So, as I don’t get back until late Tuesday night, next week’s recipe post will be on Thursday. 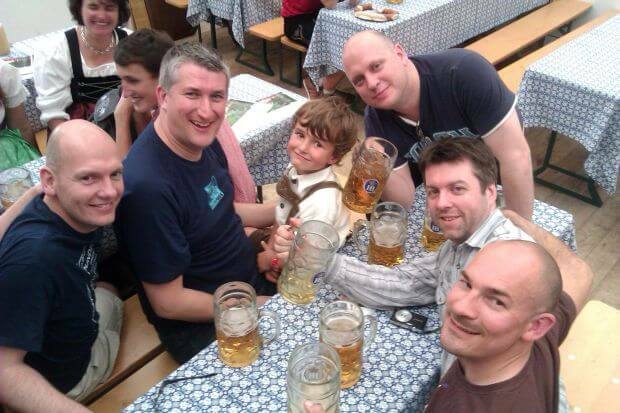 I totally forgot that I was going to Oktoberfest when I wrote at the end of the Broadmeadows house weekend post that I didn’t have any other trips planned. Well this is definitely the last one for a while. It’s been a busy September! So, cheers (or rather PROST ! ) in advance folks and I’ll catch you next Thursday for an amazing vegan Green Lentil Shepherd’s Pie! Watch the short video I made to show you how to make these delicious easy Quick Healthy Fish Cakes. It shows you how easy it really is! 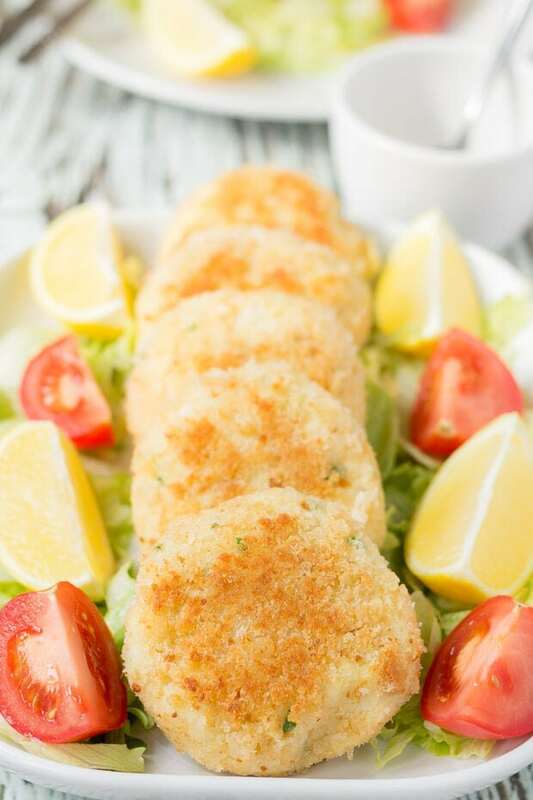 Here I’ve served my healthy fish cakes with a light side salad of iceberg lettuce, chopped tomatoes and a lemon slice to give them an added “zing”. You could also serve them with some basic vegetables like peas and sweetcorn. 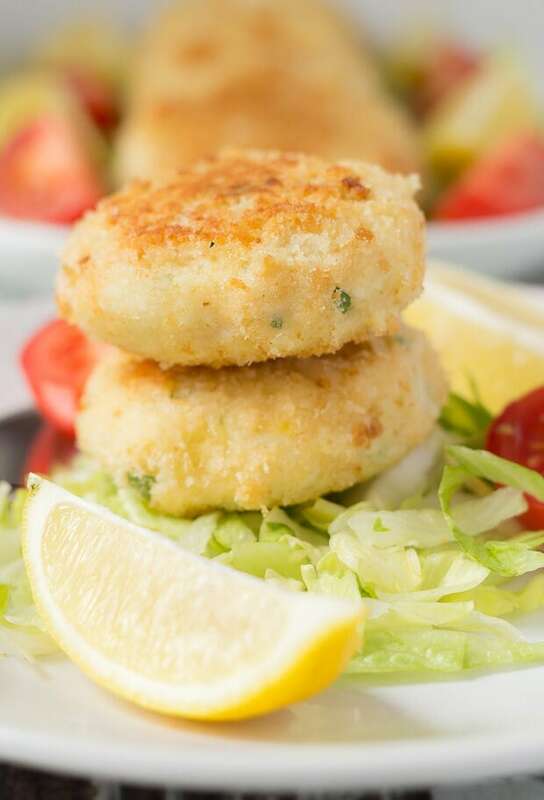 These quick healthy fish cakes are really easy to make and delicious too. Cook the potatoes in boiling, salted water for about 15 – 20 minutes until tender, drain and mash them. Place the fish in a shallow pan, cover with water, season with a little salt and cook over a low heat for about 10 minutes until the fish is tender, then drain the water away and flake the fish with a fork. Mix the flaked fish with the mashed potato, lemon and parsley and season with salt and pepper. Dip the patties into the beaten egg, ensuring they are completely covered and then dip into the breadcrumbs. Fry the fish cakes in the oil in a non-stick frying pan for 3-4 mins on each side until crisp and golden. This takes about 20 minutes in total. Serve with the lemon wedges and a crisp iceberg lettuce salad with tomatoes. Nutrition label is per fish cake. The fish cakes are freezable. *I make my own wholemeal breadcrumbs by drying out any old crusty wholemeal bread scraps I have left in the oven and then processing them in my blender. Oh man, I’ve always wanted to go to Oktoberfest! It’s one of my favorite times of the year…and I’m sure that the fact that it’s in the Fall helps! Plus, it’s a holiday about beer. That’s always a good one! 🙂 Have fun this weekend, my friend!! And take lots of pics to share with us later! So these fish cakes sound awesome. Robbie has been loving fish sticks lately, and I find this so odd because Laura and I don’t eat store-bought fish sticks. But we’ve totally been getting them for Robbie since he is a VERY picky eater, and the fact that he’ll actually eat some sort of meat is a bonus for us. I wonder if he would try these? I might need to make them into stick form, but I’m down to try it out! Thanks for sharing, my friend! Can’t wait for Oktoberfest. Just one more long day at work and then we’re off on Saturday from Edinburgh airport. Oh Absolutely loving these fish cakes Neil. It looks SUPER NEAT! How on earth did you get it to look so neat. The last time I tried making my own fish cakes, they fell apart and that was a few years ago. I have never made them since. Hi Ashika, one of the things I do so the fishcakes bind together well is to make sure the potatoes are well drained before mashing them. Leaving them to steam away by themselves, once emptied out of the pot helps. I had a google about for Gluten Free breadcrumbs GiGi, cause I think that’s what you would be looking for (but correct me if I’m wrong!) and I found a few things available, which might suit instead of the normal breadcrumbs I used?